It’s not the most subtle of fashion trends but apparently we’re meant to have our underwear on show for the end of 2009 and 2010, and there are number of different styles you can go for. The main style (also the most risqué) is going for exposed hold-ups. It’s been popular with fashion blogs, celebrities and even the more daring women of the general public. There are more patterned hold-ups and tights in the shops now so I suppose this will draw attention away from the fact that they are actually hold-ups. If you like the idea of having your hold-ups on show but are a bit self-conscious, you could always copy Michelle Alves who appeared in Vogue Brazil, May 2009, wearing them over jeans. This just seems a bit silly really, I hope it doesn’t catch on. 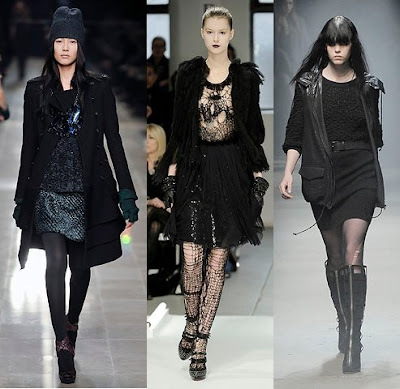 Finally, you could go grunge with the ripped tights look, first seen in Alexander Wang’s autumn/winter 2008 collection. Just looks a bit messy to me, but at least I don’t have to worry about laddering my tights when I’m out and about. Which happens. Frequently. And if you want to go all out, you could copy some ideas from John Galliano and his recent couture collection! What do you think? Do we want our underwear exposed, or is it something better left to the imagination? For lots of people, working in the fashion industry would be a dream job, whether it’s as a designer, a model or a photographer. Reality TV shows such as Stylista, Project Runway and the Next Top Model series’ have inspired more people to try and get into this line of work. This opinion is fair enough, but maybe just a little bit hypocritical. Vogue has announced that it is making its own series of short videos, Model.Live, to be shown on Vogue.TV online starting on August 19th. Apparently it’s not reality TV, “just amateurs live”. The show will follow three models through their work at the major fashion weeks and address any issues that arise including eating disorders or depression. It’s costing them a huge $3 million dollars to make (the shows are only 8 minutes long which means about $31,000 a minute) so lets hope it’s worth it! Are programmes like this worth it, inspiring a new generation for the fashion industry? Or are they just a waste of money?